All seven roles in Work Order have the ability to enter new work orders, although the form they fill out will vary from role to role. *Note: The instructions below cover the Work Order Long Form, but you can access the Short Form or the Equipment Work Order Form using the Shortcuts menu at the top of the page. *Fields that are marked with a red check mark are required fields. Click on the New Work Order tab. In the Status drop down box, choose New Request. *Note: If entering a work order that is already in progress or has been completed, you can choose the appropriate status. If your organization utilizes the Bldg./Unit field, select one from the drop down box. If applicable, choose the general Area type that best fits the location of the work request. The Request Date will automatically populate with today's date. *Note: If entering a work order that has already been completed, this date can be changed to the date of the actual request. Checking the Emergency? 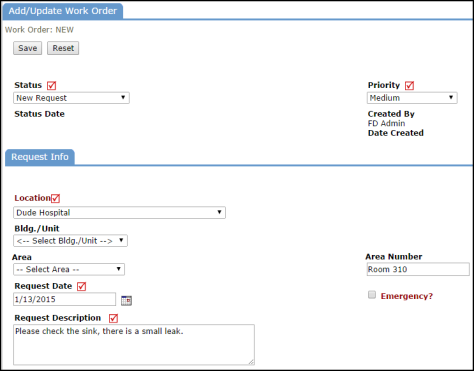 check box along with setting the Priority to Emergency, will make this work order appear in the Work Center section of the homepage as an emergency work order. Enter the complete Request Description in the open text box. Identify the name of the requester in the Contact Info section. If the requester's name does not appear in the drop down list, choose OTHER and enter the requester's first name, last name, and email address. *Note: This will add the contact as a requester assigned to the location of this request. As an Administrator or Supervisor, you can either directly assign a work order to yourself or to another user in the Assigned To drop down box or you can leave the drop down box empty for the work order to follow automatic routing rules. Choose the Purpose Code that best describes why the work order is requested. Select the appropriate Craft to identify what type of work is being requested. If your organization is utilizing Budget Codes, the Custom Category, Projects, Equipment, or Classifications and Types, identify any of the codes by clicking on the drop down boxes. You can also enter the Equipment Downtime and Cost if needed. Information entered in these boxes will show on a printed work order form. If no information has been added, blank spaces will be provided on the printed work order for a technician to record this information in the field. Click Save. The work order will now be assigned a work order ID number.